A slew of new faces will be a part of the lineup for Shawnee this season after the Renegades graduated most of last year’s state championship team. Shawnee High School’s Connor Deveney leads the Renegades up the court in a preseason scrimmage against Southern Regional High School. Deveney is one of the few players on this year’s team with previous varsity experience. The 2018–19 Shawnee High School boys basketball team looks much different than last year’s state championship winning squad. The Renegades graduated the vast majority of its lineup from last year and will enter this season with a much younger team. Despite the inexperience, long-time head coach Joe Kessler is happy with how the young players developed during preseason practices and scrimmages. The only full-time varsity player back from last year’s team is senior Connor Deveney. 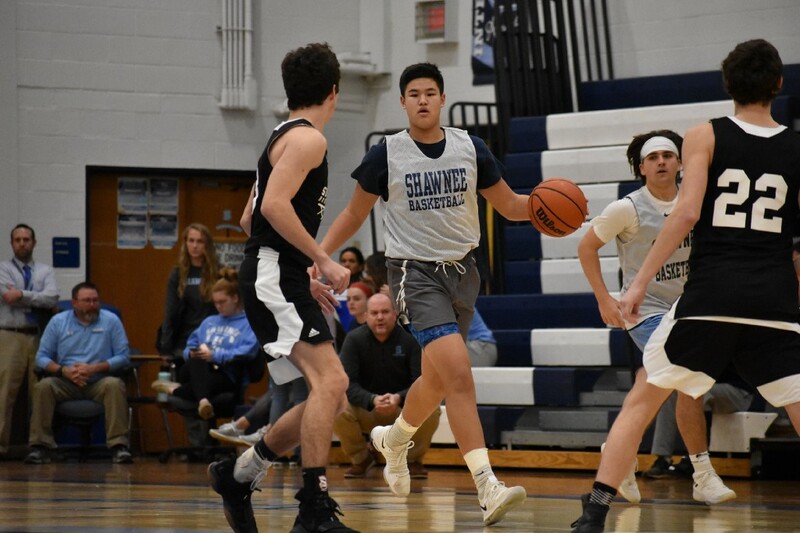 Deveney scored the go-ahead shot for the Renegades in last year’s state championship game and will be looked upon to play a lot of different roles for Shawnee this season. A number of other seniors will have big roles with this year’s team, but even those older players enter the season with a limited amount of experience. With last year’s varsity team so senior-heavy, a lot of players in this year’s senior class spent last year on the JV team as juniors. Outside of Deveney, the only other senior who got extended minutes with the varsity team last year was guard Ryan Heine. However, Kessler noted a number of newcomers have shined in the preseason. One of those players is senior Jon Searcy. After having a strong season for the Renegades’ South Jersey sectional championship football team, Kessler said Searcy has played with intensity in the opening weeks of the basketball season. At the forward position, Justin Lubin, Luke Mather and J.C. Dobis are some players Kessler expects to contribute this year. Dobis is another senior who was on Shawnee’s football team in the fall. Kessler noted Dobis and some of the football players got a late start with the basketball team because the football team’s season lasted into the first week of December. However, he expressed confidence Dobis would have a big impact on the team once he got into the full swing of basketball season. Entering the opening week of the regular season, Kessler understood this year’s team is not the same one that brought a state championship trophy to Shawnee last year and admitted there may be bumps in the road, particularly early in the season. However, Kessler feels the long-term prognosis for the program is looking up.